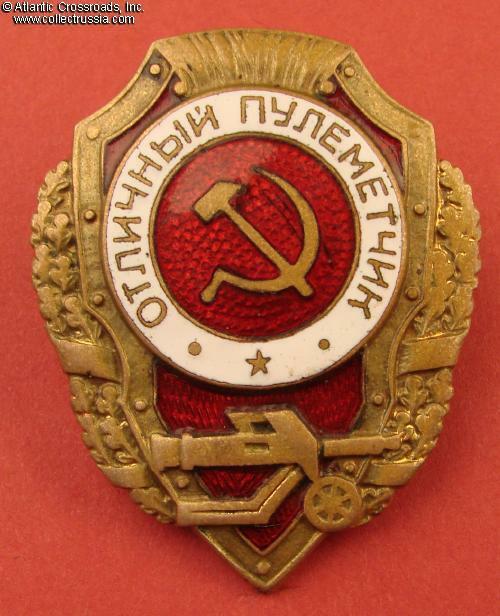 Excellent Machine-Gunner badge, late 1940s - 1950s. Brass, enamels, 45.9 x 36.5 mm. This is a relatively uncommon "Classic Flat" variation (also referred to as "Second Unified" variation) according to the Airapetyan classification, manufactured in 1953-57 by the Pobeda Factory. Features 4 sharply defined scrolls in the top ornament separated by downward pointing triangle. The shield of the machine-gun is wedge-shaped with horizontal top. In very fine to excellent condition. 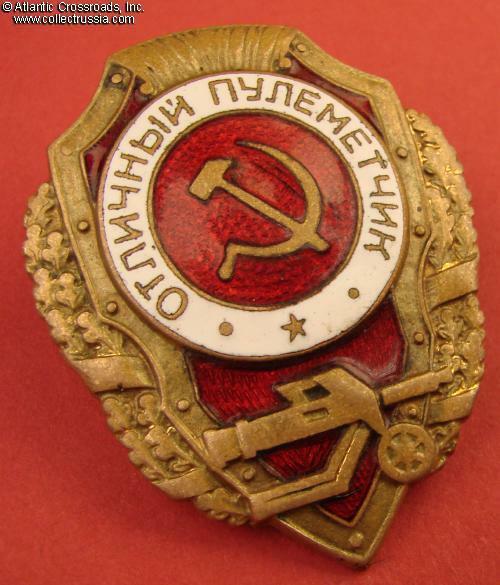 The red enamel on the center medallion shows a few tiny contact marks and a couple of microscopic flakes practically invisible to the unaided eye; the enamel is completely intact otherwise, with nice luster. There is minor wear to the high points but most details of the machine-gun and wreath are well defined. 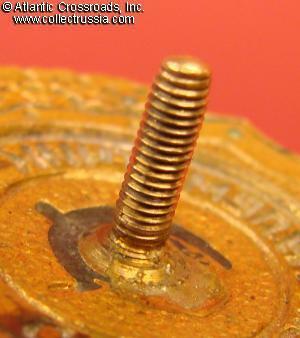 The screw post is full length, close to 11mm. 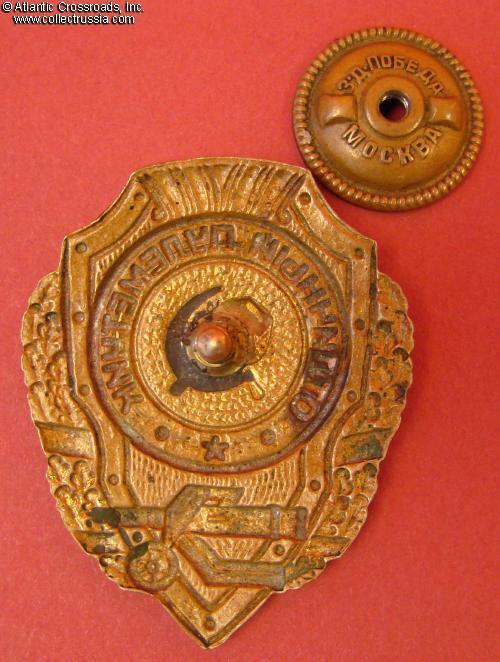 Includes original screw plate maker marked "Pobeda Factory, Moscow". 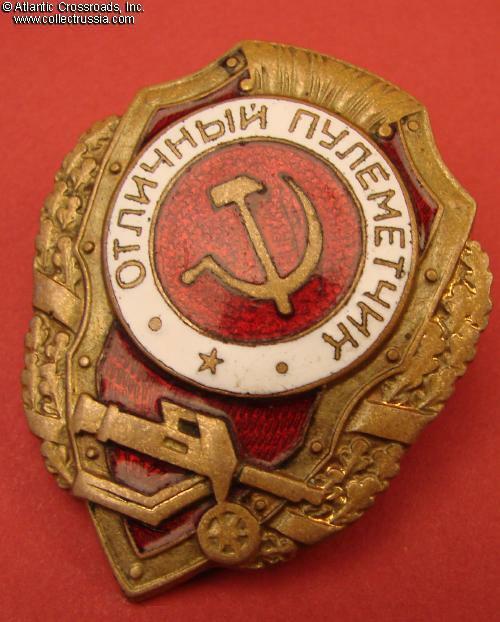 /"Breast Badges of the Red Army, 1941-1945", p. 85, fig. 10/.